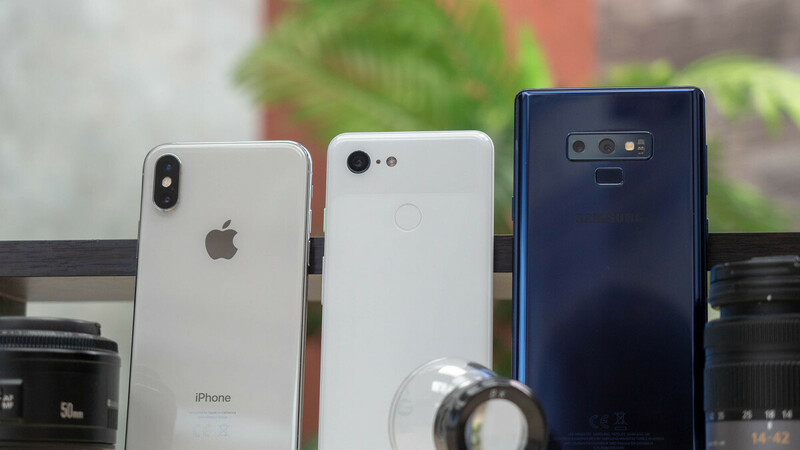 You have been hearing a lot about the best camera phones of the year, and when it comes to the very finest, three names pop up: the Google Pixel 3 series, the new iPhone XS and XR family, and the Samsung Galaxy series, best represented by the latest Note 9. But which one of these takes the best photos? We were as curious as everyone to find out and that's why we went out and shot a bunch of pictures with these phones. We will be bringing you quite a few detailed articles analyzing the differences, but before that, let's start with a blind comparison where you tell us which photo you like better. It works like this: we have hidden the names of the phones, the metadata and all other clues that might reveal which phone took which picture. For this comparison, you tell us based not on the name, but on the photo itself. Ready? Let's waste no time and get started. So that wraps up our blind comparison. Feel free to discuss the photos in the comments section below and we will be unveiling the phones that took these pictures in the very near future, so stay tuned! Forget it Vic, this thing is not even funny anymore. Everyone here knows you guys work for Apple. Well, depending on who you ask. Some days we work for Samsung, and then some days for Google, and then some days for LG. You never know. /s But seriously, it's not like we force people to come here. We work hard to get quality coverage. And if your favorite phone does not always win, it's not the end of the world. It's just how we see it and we usually explain in great detail why. I've said it before and I'll say it again. These blind comparisons only show which photo is liked the most by viewers at that particular instant. And not which one is the most true-to-life. Therefore, whichever phone wins, it won't suddenly become the best. Just thought I should put that out. To the vast majority of people, a "better-looking" photo is more important than the most true-to-life photo. Only a handful of people care about accurate photos. And too many selfies. Not conclusive than. Bottom line, you can see one is darker, one is yellowish, and one is icing. Everything is now on how you like pictures being. Like previous said by Amash you have no real scene light to compare. Maybe next time. also, there is no 100% crop. I don't care if the Pixel has the best camera, I'm going with Apple products from now on due to the fact that I've had either touch screen issues that Google won't acknowledge on my Pixel 2 XL (and I've only had it for 4 months) or general slowdown after some time during ownership which necessitates a factory reset. Then there's the pesky problem of most Android OEMs being pretty poor with updates which is why I finally went with the Pixel. The Android ecosystem and Google are slipping. Here’s a idea for a new article. Think you might like it. A blind camera test among the flagships. You can easily pick out which pics are taken with the Pixel and iPhone XS, which leaves the last as the Note 9. All the iPhone XS pics have a distinct yellowish tint to them and the Pixel post processing brightens them too much, the Note 9 seems to do the best overall job here but lacks a bit in dark situations. R won against p, ok.. Are you blind guys? Agrees, P has way more light and detail of the trees on the right side of the picture. The majority of people picked L1 under the picture "PORTRAIT MODE TESTED". Portrait mode completely failed on L1 look again. Look at the blur and branches. All were bad in their own way. L1 was the best color/exposure for the main subject (man). Composition was bad. Portrait mode was never going to work for any. I enjoy these articles, but what about the Mate 20 Pro? PA knows best. We don't have a say in it. please, please go somewhere else then. Photography is a visual art thus it's subject to each person's interpretation. There is no "better" camera, it comes down to which takes the kind of pictures you like. A number of these, I wouldn't pick any which points to a photographer issue.